No new poll so far (it's Easter Monday after all. Hope you found a lot of eggs and chocolate! ), but let's take another look at the BC election after the first week of the campaign. First of all, I stand by these projections - not a surprise given the above mentioned lack of new poll. I think that, if the trend continues, I'll start allocating more undecided to the BC NDP and fewer to the Green party in order to account for the strong "let's get rid of the BC Liberals" sentiments we can find in many polls. Using Google Trends, we can see that the BC NDP "won" the first week but its leader John Horgan still trails Christy Clark (note: I didn't incldue the BC Green party because it doesn't register as a political party in Google Trends and I therefore can't do a topic search with this party). Over the course of the 2013 campaign, Google Trends would have predicted the Liberals to be ahead (you get a bigger gap in favour of Christy Clark if you use the party leaders' names). It's interesting. The electoral track record of Google Trends is far from perfect but I see it as a valuable tool to use on top of the polls. So we have contradicting evidence so far. It confirms that John Horgan has a serious problem of public awareness about him (especially compared to Christy Clark that everybody knows) but his party seems to have won the first week. Similar conclusions to my previous blog post. I think it's interesting to see that the main two parties have almost identical total ranges (from 17 to 68 for the NDP for instance). It really shows how close this race could be. 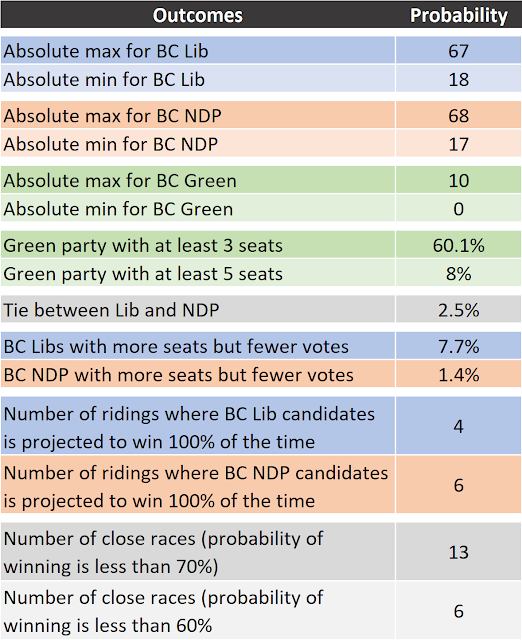 Also, the BC Liberals have more chances to win more seats with fewer votes. Surprising since in 1996 the opposite happened. I guess this is likely due to the presence of the Green party and the lack of the Reform party (in other words: the left is split now, not the right). Finally, and maybe the most important part, the election is really currently played in 13 ridings out of 87. You are never guaranteed a win of course but the model hasn't hisrtorically made many mistakes in ridings where one candidate had more than 70% chances of winning (duh, I know, the model would be fundamentally wrong if that was the case). Polling mistakes can skew the mistakes one way (by systematically underestimating one party) but the ridings switching first are the uncertain ones.